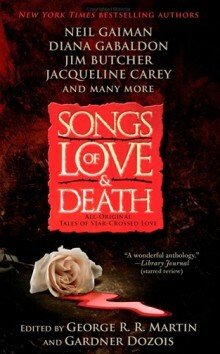 Purchasing links for SONGS OF LOVE AND DEATH appear in the pull-down menus on the left. “A Leaf On The Wind of All Hallows” was also been released as a stand-alone e-book in December, 2012. More information. This story was also included in A TRAIL OF FIRE, an anthology of four Outlander tales. More information. For more information on the availability of my short fiction, see my blog from September 4, 2012. In this star-studded cross-genre anthology, seventeen of the greatest modern authors of fantasy, science fiction, and romance explore the borderlands of their genres with brand-new tales of ill-fated love. From zombie-infested woods in a postapocalyptic America to faery-haunted rural fields in eighteenth-century England, from the kingdoms of high fantasy to the alien world of a galaxy-spanning empire, these are stories of lovers who must struggle against the forces of magic and fate. This page was lasted updated on Monday, December 28, 2015 at 12:18 a.m. (PT).